What’s at stake in this election? 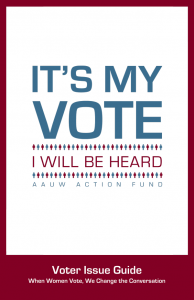 Find out using the AAUW Action Fund’s Voter Issue Guide. This helpful handout provides concise information about key policy issues in the election, including the gender pay gap, family leave and paid sick days, college affordability, campus sexual violence, and reproductive rights. Use it when you table on campus, attend a town hall, or host a candidate forum. The guide even includes topical buzzwords and questions to ask candidates. Research shows that a lack of information on the candidates and a lack of policy debates on issues of importance is the main reason some millennial women don’t participate in the election process. Help combat the dearth of information. Copies of the AAUW Action Fund Voter Issue Guide can be requested through the upcoming events form.